What the hell is a Maduko? You’re not the first person to ask that question. The Maduko story is one of trials, tribulations, triumphs and troublesome alliteration. 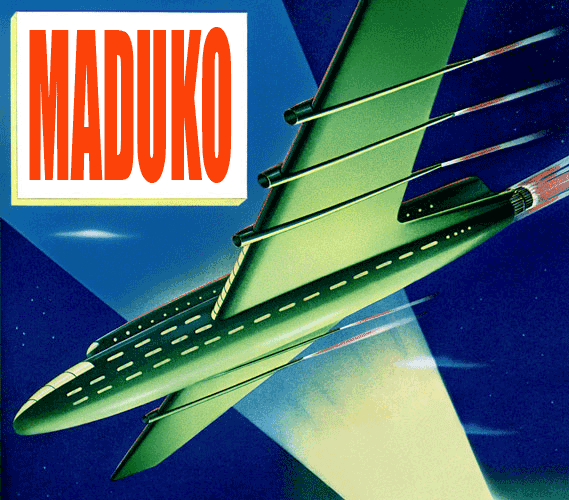 Often overlooked by historians, the technological advances pioneered by Maduko engineers is often unbelievable. Some might even call it the work of science fiction. From meager beginnings a small cadre of scientists, engineers and jazz singers eventually changed the world. The story of Maduko begins in the mid Seventies. I worked a summer job at a car parts store in Tulsa, oddly enough it was called Car Parts, Inc. That’s where I met Dart Steed, an encounter that severely impacted my young life (but that’s another story). Dart worked the sales counter while I stocked the shelves, made deliveries, boxed up shipments and put nasty old brake shoes in burlap bags- typical high-style glamor stuff. But on occasion I would answer the phone if needed. This is when I first encountered a character named David Burdick. Roads with deep grooves proved too expensive. David and Dart played music together. For those not familiar, when you play in a band together you have to talk to each other on the phone all the time. It’s similar to teenage girls constantly yacking on their pink Princess phones- oh sorry, I mean texting. The litany of wacky sounds that came through the phone that day was at once hilarious and fascinating. 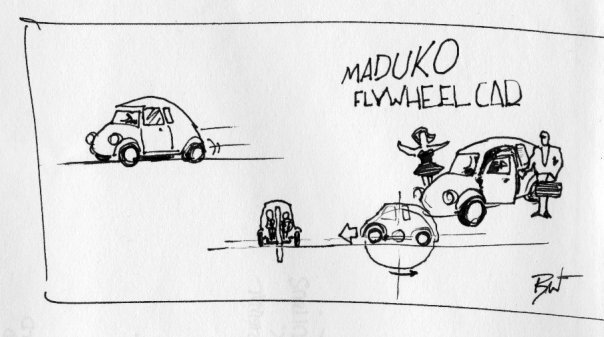 The bit about “1948 Maduko” so intrigued me it became a running gag. Just saying the word struck me as humorous. Soon any offbeat or unusual car or part or gadget had some distant lineage to a long-forgotten Maduko design. The word itself took on a life of its own, “What a Maduko!” It was like comparing something to an Edsel. Quasi Maduccino as a young man. It wasn’t long before I was drawing strange or impossible machines that had supposedly been manufactured by the fictitious Maduko factory. Wingless airplanes, mammoth airliners, race cars with one wheel- all seemingly impossible. But not for Maduko! 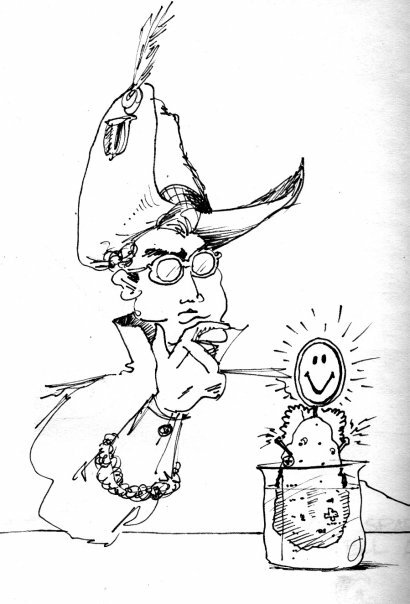 I even invented a corporate history, complete with an Italian immigrant founder and futuristic headquarters. If the whole idea was just an inside joke, it officially got out of hand in 1988. That was the year I struck out and opened a car parts shop of my own. Struggling with what to call this new venture I fumbled through the classic and forgettable combinations of initials and names. Rex and Jackie’s just wasn’t doing it for us. Eventually we decided to name it Maduko Motori and for nine years operated quite successfully from a warehouse at 114 N. Boston in Tulsa’s Brady District (today it’s Hey Mambo pizzaria). The joke that got out of hand continues to this day. As I searched for a clever name for this blog I once again went with a familiar, if meaningless, monicker. Welcome to the Maduko World Headquarters. Maduko Motori flashbacks!! Too cool! Yeah man, Group B is where it’s at! Still looking for alfa v6 oil filters….. apparently Paul bought the last ones available….. I was one of your customers back in the mid-90’s… ’73 Fiat 124 Spider, always needing clutch cables (at least until I figured out that the clutch pedal was bent and cracked and was wrenching the barrel end off the things). First part I ever bought from Maduko was a brake booster; suddenly I could stop on a dime! Best thing was, I was living in OkC and you were in Tulsa, so I got next-day delivery for the regular UPS shipping price. You guys were the best. Glad I found your blog! I look forward to reading more. Cheers!